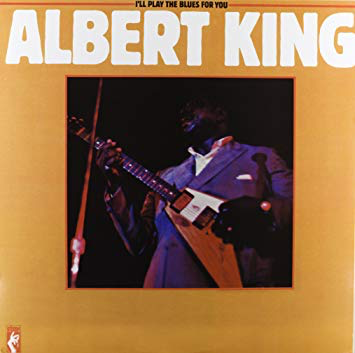 This is a truly magnificent album that saw Albert King augmenting his blues guitar sound with Stax horns and Memphis soul sounds. It is wonderfully remastered here (in the Stax remasters series) in a warm, full, vibrant seventies-style separated stereo. It is simply pleasure to listen to. All the material is top notch - the brooding but melodic, extended title track, the soulful "Little Brother" and the sublime grinding funky, lyrically cynical soul groove of "Breaking Up Somebody's Home", with its sumptuous horns, get the album off the a superb start. King's guitar is magnificent and the overall vibe is just cooking to boiling point. It drips with soul. Lots of echoes of Al Green and Ann Peebles all over it. The organ/bass/horns funky guitar interplay four minutes in is truly intoxicating. Great stuff. Man, I love this album. "High Cost Of Loving" is a guitar-drenched pounder of a blues. The cover of Marvin Gaye's "I'll Be Doggone" is a live cut with a funky James Brown vibe to it. 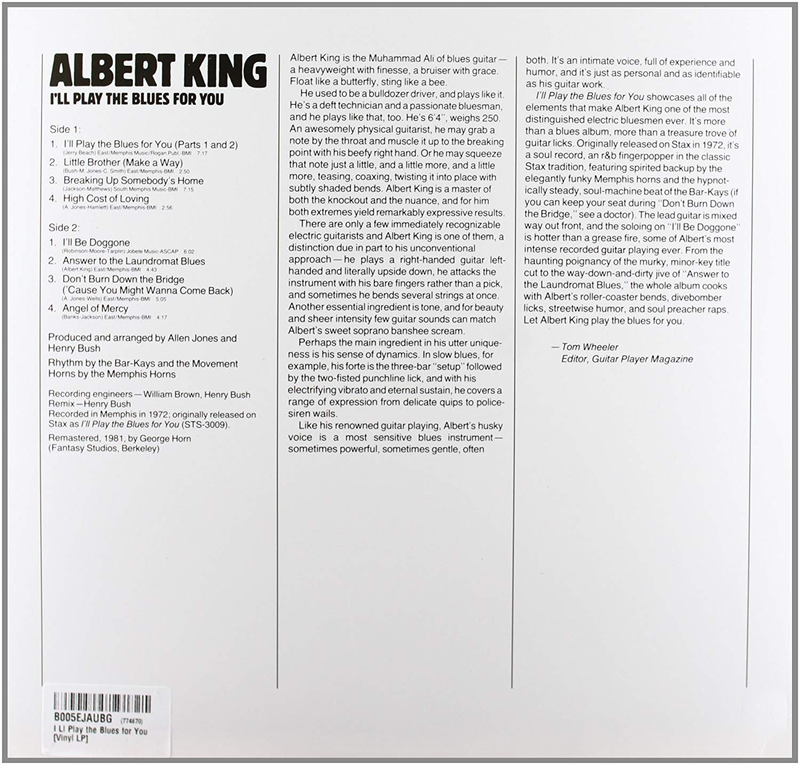 "Answer To The Laundromat Blues" is a tongue-in-cheek riposte to King's 1967 blues classic. It has an ad hoc live feel to it, although it would appear to be a studio recording. "Don't Burn The Bridge" is a searing piece of blues rock, in the BB King style, with some excellent guitar. As on all the album, the sound is absolutely first class. The final track on the original album is the slow-burning, horn-introduced blues of "Angel Of Mercy". A real copper-bottomed blues. 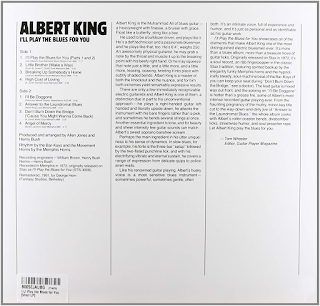 The "Alternate Version" of "I'll Play The Blues For You" is scintillating too, replacing the spoken word vocal parts with more guitar and saxophone. I simply can't recommend this album highly enough if you like the blues and you like Stax. You will be in Heaven.